Ask Dan! about DSS - What is visual analytics? Visual analytics combines automated analysis techniques with interactive visualisations to support decision making using very large and complex datasets. fferent representations for further exploration (as indicated by the Transformation arrow in the figure). Other typical preprocessing tasks include data cleaning, normalisation, grouping, or integration of heterogeneous data sources." erent visual views on the data. Findings in the visualisations can be used to steer model building in the automatic analysis. 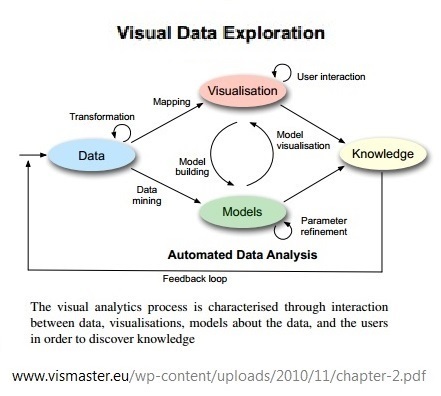 In summary, in the visual analytics process, knowledge can be gained from visualisation, automatic analysis, as well as the preceding interactions between visualisations, models, and the human analysts."